Sen. Susan Collins accused me of trying to “bribe” her when I pledged $20.20 to her future opponent if she votes to confirm Brett Kavanaugh. I’m not a criminal. I’m a citizen. I’m not offering to pay Collins for a vote – I’ve decided to support a different candidate if she chooses to support this nominee. I’m not alone: As of press time, more than 46,000 people have pledged more than $1.2 million to her 2020 opponent if she chooses Kavanaugh for the highest court. Collins claims the Crowdpac fundraiser is of questionable legality, though experts note that donations to a challenger don’t “bribe” the incumbent. 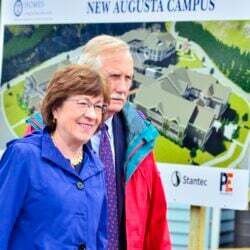 Collins raised $6.2 million between 2009 and 2014, with 44 percent from political action committees, according to Federal Election Commission filings. It’s little wonder that Collins is rattled by the Crowdpac campaign: Since late August, it’s raised nearly 20 percent of her five-year take, and it’s done so with average donations of $27.74. Unlike many of the super PACs that pour into Collins’ coffers, this effort is being led by Mainers, alongside Ady Barkan, a health care activist and young father dying of amyotrophic lateral sclerosis. Like Ady, I’m disabled, and like my young niece, I’ve had a pre-existing condition since childhood. Kavanaugh has not committed to upholding protections for people with pre-existing conditions. I’m worried by Kavanaugh’s emails suggesting he hasn’t testified truthfully under oath. I disagree with his views on guns and reproductive rights, racial profiling, torture and the rights of indigenous Americans. I’m deeply troubled that he thinks it should be illegal for a sitting president to be investigated. No one should be above the law. If Sen. Collins votes for Kavanaugh, I don’t think she should be re-elected, and I’ll help fund her opponent. There’s nothing criminal about that.